Back in the days of the Third Stream, work mostly seemed concerned with finding space for improvisation within the limits of the classical form, an approach that often made the music feel needlessly stuffy. 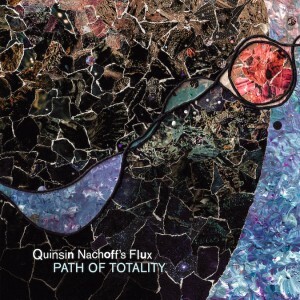 Quinsin Nachoff, by contrast, uses structures borrowed from the classical realm to make his music more open and expressive. It helps that the saxophonist’s compositional signposts are found not in the 19th century classical tradition, but in the strategies of 20th century aleatoric and electronic music. “Toy Piano Meditation” evokes John Cage’s Suite For Toy Piano both in its title and the way it repeats and transforms a five-note phrase. But Nachoff’s crew also nods to Lou Harrison’s orchestral version of Cage’s piece, particularly in the gamelan-inflected percussion of Mark Duggan. “Bounce,” meanwhile, uses structures derived from a mathematical description of a bouncing ball (physicist Stephen Morris did the calculations). These are substantial compositions—both “Bounce” and “Toy Piano Meditation” last more than 19 minutes—but there’s no sense of sprawl. Credit some of that to the hyper-kinetic drumming of Kenny Wollesen and Nate Wood, whose play (and interplay, on the two tracks where both are present) never is less than invigorating. It’s also worth noting that by not using a bass player, Nachoff keeps the tonal centers loosely defined, enabling more improvisational latitude. In all, Path Of Totality is a stunning, deep dive of an album, the sort of music in which one could spend hours submersed. Personnel: Quinsin Nachoff, tenor, soprano saxophone; David Binney, alto and C-melody saxophone; Matt Mitchell, piano, keyboards, Esty pump harmonium; Kenny Wollesen, drums, percussion (1, 3, 4, 6); Nate Wood, drums (1, 2, 5, 6); Jason Barnsley, Kimball Theatre Organ (2); Mark Duggan, percussion; Carl Maraghi, baritone saxophone, bass clarinet (4); Dave Urness, Matt Holman, trumpet (3); Ryan Keberle, trombone (4); Alan Ferber, trombone, bass trombone (4); Orlando Hernández, tap dance (4); David Travers-Smith, synthesizer.